Reginald Frederick Johnson Hayward was born on 17 June 1891 near Swartberg, South Africa. London Gazette: WEDNESDAY, 24 APRIL, 1918. Lt. (A./Capt.) Reginald Frederick Johnson Hayward, M.C., Wilts. R. For most conspicuous bravery in action. This officer, while in command of a company, displayed almost superhuman powers of endurance and consistent courage of the rarest nature. In spite of the fact that he was buried, wounded in the head, and rendered deaf on the first day of operations, and had his arm shattered two days later, he refused to leave his men (even though he received a third serious injury to his head), until -he collapsed from sheer physical exhaustion. 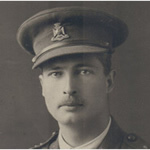 Throughout the whole of this period the enemy were attacking his company front without cessation, but Captain Hayward I continued to move across the opera -from one trench to another with absolute disregard of his own personal safety, concentrating entirely on re-organising his defences and encouraging his men. It was almost entirely due to the magnificent example of ceaseless energy of this officer that many most determined attacks upon his portion of the trench system failed entirely. The records of Lodge and Industry at United Grand Lodge show that Reginald was attributed to war service between 1914 and 1918. His service as a Freemason continues beyond records in the public domain.